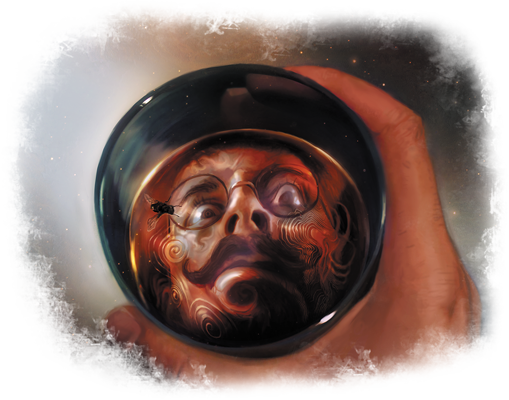 "Fool that I was to plunge with such unsanctioned phrensy into mysteries no man was meant to penetrate…"
Arkham Horror: The Card Game recently made its way to retailers, and fans everywhere have begun to delve its secrets, discovering the many ways in which it subverts the traditional card gaming experience with the insidious freedoms, characterizations, and narrative frameworks of a roleplaying game. The result is that you don't just manipulate cards as you play, but you slowly slip deeper into the game itself. You become your investigator, and you jump whenever you hear the telltale clatter of footsteps rounding the corner of a dark, cobblestone alleyway. The game goes to great lengths to help you experience each adventure from your investigator's point of view. Its graphic design evokes the styles of the 1920s. Its artwork is framed to force the most terrifying elements of your challenges immediately into your view. And you can only explore those locations where your investigator has traveled. Most of all, you share your investigator's limitations. You can only hold two items that require a free hand. You can only wear one body's worth of gear. You can only focus on so many arcane secrets at the same time. And you have your flaws. As enjoyable as it can be in a customizable card game to craft the perfect deck, people aren't perfect, and the Arkham LCG® acknowledges this through the weaknesses it forces you to build into your deck. Of course, these weaknesses might very well surface at the most inopportune of moments. They might even transform your imminent victory into a tragic defeat. But that's part of the beauty of the game. That's part of what makes it a terrifying, Lovecraftian experience. That's very much near the center of all that makes the game an Arkham Horror Files game. 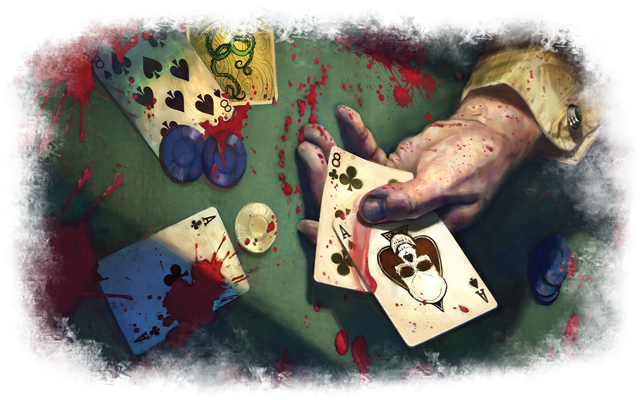 Because we believe that the weaknesses of the Arkham LCG are such an integral part of its experience, we offer you, today, one of the strangest previews you're likely to see in the world of card gaming. 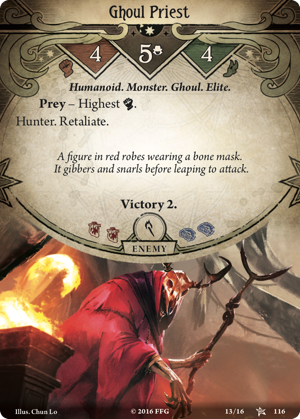 Instead of focusing on all the ways that the new player cards from the upcoming The Dunwich Legacy deluxe expansion can enhance your deck, we're going to look at some of the horrifying misery and tragedy your characters can expect to confront. 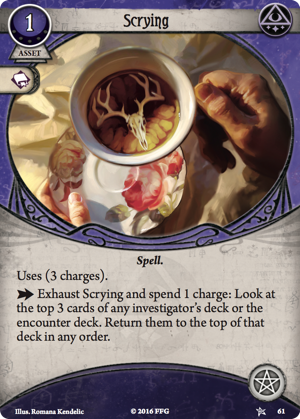 Like the investigators from the Core Set, the five investigators from The Dunwich Horror each come with two signature cards—one of which will be a beneficial asset or event, and the other of which will be a weakness. 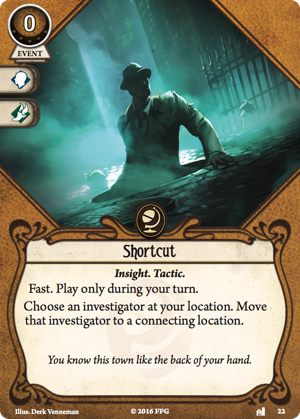 In the Arkham LCG, these cards represent a good deal of who you are as an investigator. For example, if you happen to be playing as Rex Murphy, you'll be investigating the game's strange phenomena as the hard-luck reporter whose evidence keeps disappearing before he can finalize his stories. 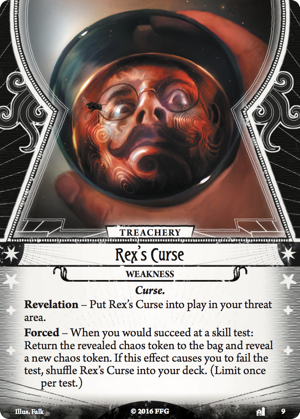 Rex's Curse (The Dunwich Legacy, 9) reflects this streak of strange bad luck by forcing to watch your chaos tokens slip away from you. True, you might be able to succeed at your skill test even after you reveal the second chaos token, but if you do, you know your Curse will still be in play for the next one. Eventually, it's going to catch up to you. 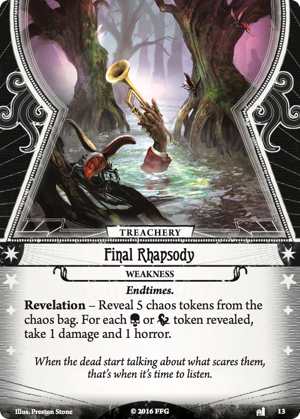 Fortunately, if the threat of having to overcome your bad luck time and again doesn't appeal to you, there are other investigators you can choose to play, including musician Jim Culver, who almost never has to deal with his signature weakness— Final Rhapsody (The Dunwich Legacy, 13)—more than once per game. On the other hand, Jim’s weakness can deal a significant amount of damage and horror, especially when the chaos bag has lots of skull tokens in it. In a situation where all four skull tokens are in the chaos bag, it can potentially deal as much as five damage and five horror! When you play as Jim Culver, you'll likely be conducting your investigations in the shadows of dread and with an appropriately keen sense of your own mortality. Jenny Barnes doesn't run any risk of dying as a result of drawing her weakness, Searching for Izzie (The Dunwich Legacy, 11). However, there's a very real chance that her sister's disappearance will haunt her throughout her investigations, and she'll need to pursue every lead she can find to her sister's whereabouts. If Jenny doesn't consistently take action so that she can console herself with the fact that she did all she could, her sense of loss may ultimately get the better of her, driving her to despair and madness. 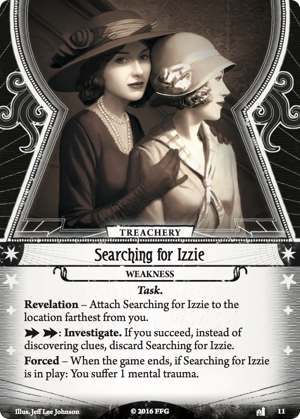 And although it may prove relatively easy to spend the two actions to investigate the location where you attach Searching for Izzie, it's the fact that the card always attached to the location furthest from you that's truly maddening. This is especially true if you're nearing the final location in an adventure like The Gathering. After you've battled ghouls and braved supernatural terrors just to gain access to your Parlor, you won't necessarily want to tangle any longer than necessary with the Ghoul Priest (Core Set, 116) in your house, just to make sure you hadn't overlooked any clues about Izzie's disappearance that you might have left in your nearly unrecognizable Cellar. Instead, when Searching for Izzie appears in the thick of your battle with the Ghoul Priest and attaches to the Cellar, it's almost a guarantee that you'll suffer a point of mental trauma that you'll carry with you for the rest of your campaign. Whether you have a recurring weakness like Rex Murphy's, a dangerously potent drop-kick to the gut like Jim Culver's weakness, or a weakness like Searching for Izzy that wants to send you racing in the wrong direction during your adventures—the truth is that it's never good to draw your investigator's weakness at a critical moment. However, it helps to be aware of these flaws, just as it helps to be aware of our character flaws in real life. 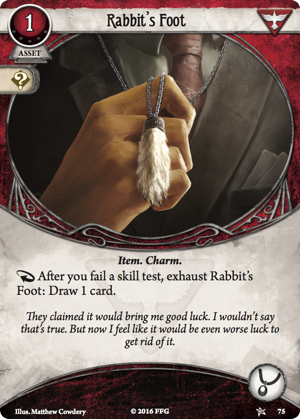 As Rex Murphy, you might try to offset your bad luck Curse with a little help from a Rabbit's Foot (Core Set, 75), so that even should your bad luck cause you to fail at a check, you might still gain something from the encounter. As Jim Culver, you might add a copy or two of Scrying (Core Set, 61) to your deck and use it whenever your health or sanity are at risk should you hear the Final Rhapsody. 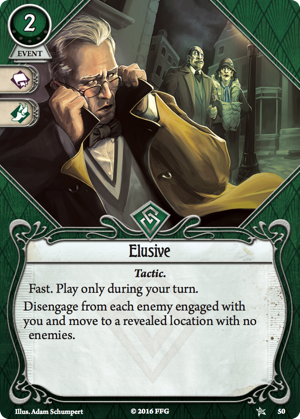 And as Jenny Barnes, you might do well to stock your deck with some cards that facilitate quick movement, such as Elusive (Core Set, 50) and Shortcut (The Dunwich Legacy, 22). In the end, the Arkham LCG is notable not just for the way it lets you manipulate this puzzle built of cards. Unlike the myriad customizable card games that challenge you to find answers among your cards to the cards that your opponents play, the Arkham LCG isn't even just about "winning." The Arkham LCG is about adventure, and your weaknesses play a critical role in your experience of the adventures you undertake. You can't expect your deck will only give you good things; there's always a chance that things can go horribly, horribly wrong. 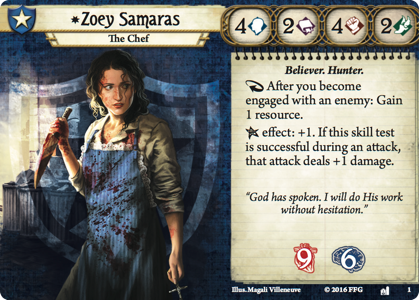 Like Zoey Samaras (The Dunwich Legacy, 1), whom we've seen earlier, each of the five investigators from The Dunwich Legacy features one primary class, then allows you to dabble with level zero cards from all the other classes. How will you use these cards? Will you use them to play to your strengths, or will you use them to mitigate your personal weaknesses? Who will you become? 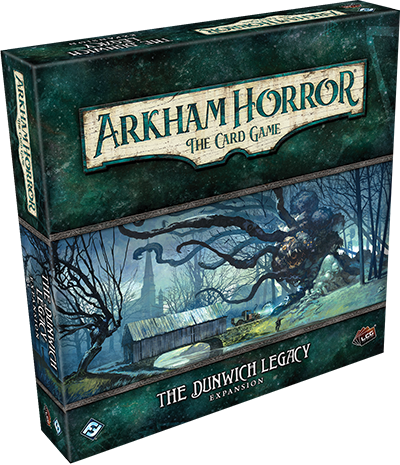 Head to your local retailer today to pre-order your copy The Dunwich Legacy!